The spread of the railways, the decreasing price of train tickets, and the introduction of Bank Holidays encouraged people of all social classes to go on excursions out of cities. Trips to seaside resorts quickly became popular. While some took advantage of shorter journey times to make a day-trip to resorts like Walton on the Naze in Essex, many others stayed overnight or for a couple of days, usually in hotels and inns near the sea. Hotels created a total holiday experience for trippers, providing facilities such as cricket pitches, tennis courts and boats for hire. 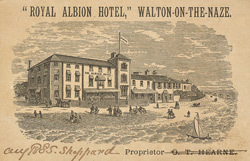 The Royal Albion Hotel had been largely destroyed by fire in 1878, but was extensively reconstructed into the building pictured here.